You can enjoy a free unlimited TracFone texting. However, there are some limitations. First of all, long texts are a no go. TracFone allows a very limited set of text characters to filter through on the preview screen. I discovered this when I was taking some time off from my Livermore real estate agent office at http://www.tricityhome.com with my daughter watching my son practice soccer. She happened to purchase a TracFone and wants to text, but there is a fee involved when texting. So, during the free time we had, we explored what combinations of texting characters can we send for free and still get across a meaning to the receiver. As long as the receiver does not open the text message, certain text messages can be understood without opening. Here is what we came up with for texting for free. This is what I see when I send free unlimited TracFone texting to my daughter from my iPhone. To get unlimited free texting on the Trac Fone phone, you may have to experiment what works for you. My wife used the same characters but was unable to get through. She had to come up with her own set of free texting characters. I used my TracFone unlimited free texting characters today. 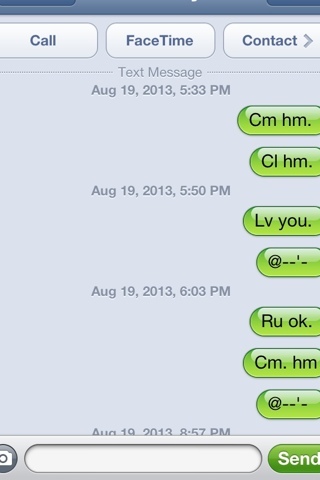 I texted CM space HM. Three minutes later my daughter walked through the door. It may not be real free texting, but it accomplished two things. One, it brought my daughter and I closer together while problem-solving. Two, it saves a few bucks, and that makes my daughter happy.